Habitat: Mexico to Nicaragua. Encyclia aenicta is found growing on the western slope of the Sierra Madre mountains in pine and oak forests. It is found growing between 500 and 2000 meters in elevation where it grows on oak trees or rocks. Plant Size: Medium. Encyclia aenicta has clustered, upright to oval pseudobulbs. Each growth produces between 1 to 3 rigid leaves. Flower Description: Flowers are bronze with a lighter colored lip. The flower are profusely produced on a tall (to 1 meter), branched inflorescence which extends above and beyond the leaves. Growing Temperature: Adaptable. Warm to Cool. 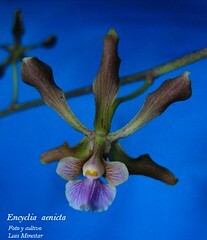 Additional Information: Encyclia aenicta is related to Encyclia diota and Encyclia meliosma. Mature specimens are impressive in bloom. Grow in a pot in a well-drained orchid media or mounted on cork bark. Provide bright light, good air circulation, and ample water and fertilizer during active growth. Let the plant dry out some during the late fall to the spring.